Have you ever made a decision you wish that you could have taken back? That decision to say, act, or even eat something you wish you could change. 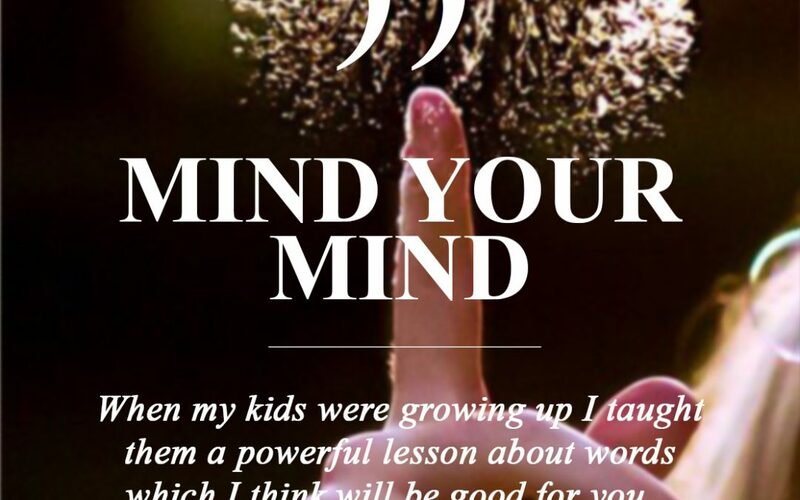 When my kids were growing up I taught them a powerful lesson about words which I think will be good for you. I may have shared this before but once when they were younger, I took them outside and we blew bubbles. I told them to try to catch the bubbles and put them back in the bottle. They all soon realized that after the bubbles escaped the apparatus there was no returning them. This applies to every area of our life. Once you let it escape you–whatever your it may be–it will then be impossible to get back. I did not say impossible to change or fix. Changing and fixing requires much more work than allowing it out. Henry Ford said, “Thinking is hard work so that’s why few do it.” But I say not for the believer. One of the key elements that God has given to each of us is the ability to think. Unfortunately, most have been taught to talk but not think. However, thinking should be the principle thing before you act, talk, buy, eat or anything you do. Seek first the kingdom’s way of doing before you do. Last week I posted a quote on my instagram page that says,” What you decide to do in a moment can change your life forever! That’s good or bad.” and captioned “think first.” So many people make decisions without thinking and it has caused them to be in some very tough and difficult places. Then we beg, plead and ask why did God let us to get in those difficult places. I want to challenge you to mind your mind–mind your thinking. You are where you are in life by the decisions you have made with or without God and in order to turn your life around, if you have made decisions without Him, is to start making new ones with Him. Thinking is critical for your success in life. Christ died for you and I to not only receive salvation but to live out the rest of your life with His mind. Jesus was a thinker. He didn’t just haul off and do stuff. He carefully surveyed circumstances and situations before He took action. And this is how we should approach our day to day and moment to moment decisions. It’s not fair to be mad or blame God for where you are in life if you have not always included Him. It’s easier to blame others for your faults but blaming others won’t change your position. Thinking before acting will put an end to future regret. Today I would love for you to take responsibility for where you are and change your life. Pause, Think, and then Act! I pray you look forward today to a brand new start, with fresh eyes on where you are headed. Now who’s joining the P.T.A. Club – Pause-Think-Act with me? I almost feel like you were listening to my prayers this morning. I guess by you posting this, I’m not the only one. I truly appreciate this Word and thank you for your obedience. Love you so much. Dr. Dee Dee this is so powerful and you as are so right. We can apologize for our words and our actions, but usually the damage is already done. A lot of times we make decisions without consulting God and unfortunately those choices negatively affect us and those around us. Awesome liberating advice this morning! This blog was right on time for me. I am currently at a crossroads. How do I know when I am over thinking a situation, versus thinking it through in prayer? I have that problem most of the time and I just ask God to guide me in the correct direction. The direction generally ends up being the one I was leaning towards initially. This was an awesome reminder to think before we speak/act, include God in our lives and not be mad at God for something that happened in our lives if we have not always included Him. It reminds me of the scripture in Proverbs 19:3 NLT “People ruin their lives by their own foolishness and then are angry at the Lord.” (Hmmm…imagine that 😆). Thank God I don’t have to do that because now, thanks to this blog, I’m a part of the P.T.A. Club – Pause-Think-Act! Great Word Dr. Dee Dee!! I will definitely take heed! Now that was good Carmen! I took PTA and went back and added it like I thought of it myself😜 LOL! Thank you for reading!! This is so true we something allow our feeling to take control of our actions. Thanks for sharing this word to cause us to be more proactive with our thinking vs reacting to our feeling. I just love these nuggets to live by. Thanks for being obedient to cause change. This timing is on point! I had a three-way call with my two adult daughters this weekend; where I apologized to them for being a single mom most of their lives. I feel that had they had a Dad in the home they would have seen what real love looks like. Instead, I didn’t date so there wasn’t an example present. There wasn’t family close by either, because I was in the Army for 20yrs and moved every 3-4yrs. It’s never too late to say I’m sorry, correct a mistake, or take responsibility for an action even to your children. THIS IS AWESOME,I’M WORKING ON DOING THAT,THIS IS CONFIRMATION FOR ME,#OKGODIHEARDYOU#.THANKS A BUNCH,OH AND I DID SEE THE POST ON INSTAGRAM LAST WEEK.AGAIN THANK YOU. Thank you for that wonderful word!!! It ministered to my heart! This is so true. Thank you for sharing your blog with me. This is such a timely word. Yes I have started this process with changing my words,and seeing what I want to happen in my life.I have ask Holy Spirit to put a watch over my mouth🤐.I have been talking with my husband to keep me accountable for the words that are coming out of my mouth.So that we can more success with are relationship and family.We have been listing to Pastor Mike and You.Seeing how to think things through and getting better results in life.Thanks for Doing Life togather with Us. So we will apply these strategies Pause,Think,Act. Until next time for Life Lesson. Powerful, I love it. You are so right. I have seen the consequences of not thinking versus thinking about my decisions/actions. Thanks Mom! This was great, Dr. DeeDee! Lord, teach me to mind my mind, by pausing, thinking and then acting! Amen thank you Dr. Deedee I would love to be a member of the P.T.A club. Blessings and love. Thank you for these words of wisdom. It reminds me to slow down to force myself to think and talk to God before steaming ahead on my own. Thanks Dr Dee Dee! Thank you for sharing this insight, PTA. You are on point. When I became introduced to the concept and discipline of critical and creative thinking 33 years ago,thinking like this and expressing it was unheard of. I APPLAUD you for sharing it with believers. In addition , I would like to say THANK YOU for your FAITH. When I grow up, in the Lord, I want to be just like you. The example you set when face with Pastor Mike’s health challenges stays with me daily. I can only pray to be half as strong in my FAITH as you have demonstrated. I’m in the PTA Club. This weeks blog has made me examine myself. I needed this 3 weeks ago! I’m trying to undo the words that I allowed to come out of my mouth. SMH Thank you Dr. DeeDee I love the bubble analogy it is definitely true. OMGooosssh, so joining P.T.A. The pain, disappointment of looking at your life, where you are. And, to know you should be better off and further down the road, more mature in Christ but the auto-polit thinking, the decisions not cleary made bcuz half-way, half-hearted, or did not consult God/Holy Spirit, it’s piercing, heavy. At 45 and looking at life like whose life is this. But, I had to be honest with myself, I learned long ago to tell myself the truth, be honest with me. It’s my doing–that’s hard… facing that you done your own self in. So… again right now Word. I will not faint or lose heart, it is a fight but I know I have a hope in Christ. And, I also know I have to take my thinking off of auto-polit and “Go Get My Life”. Whoa, deep, deep breath!!!! Hello Dr. Deedee, these are great words of wisdom. I am definitely for the P.T.A. I call it “being intentional” about everything you do because Jesus was “intentional “every time he used a parable. This was necessary to teach His disciples to think on their own and use wisdom when making important dicision. Blessings to you and thank you for your thought provoking words. I have been doing this for a couple of years now. Because I know that my mouth can be reckless and deadly. In the past I know I have injured people because I was angry (which is NEVER an excuse). I asked God to help me to control my tongue but I know that I must be mindful before words run out of my face. Is it possible, yes, is it easy absolutely not. But it’s worth it, ni matter wht my flesh says. This blog is loaded with so many words of wisdom! Thank you for the reminder! Thank you for such a powerful word. I’m part of the PTA club! Thanks Dr. Dee Dee! I’m already careful about what I say and how I say it, but your message has allowed me to be even more conscious of my words. I’m glad to join the PTA Club! Life changing mind over matter. I join PTA. Powerful, powerful guidance! You make a decision which you believe is spiritually Led. Then you wonder God, why am I here? You know me better than I know myself. Why put me in this position? You know my particulars. Then you have an experience where you be like what, wait, how lord help me to keep my composure. Did they really do this? Lord help me to act accordingly. Then you hear Holy Spirit say YOU HAVE BEEN PUT IN POSITION. Okaaaay! So you think and you ask for guidance. He showed me where to start, which led me to confront I guess I will call the obstacle. Then you wonder what do I do? Am I to give guidance on what I believe was a fault in His eyes or is He instructing me to step in and display His Works. Wow! What a position to be put in. Somehow doing all of this you allow that of the surface to intrude and then you just feel like you are just ready to get physical because this obstical has crossed you by way displaying a behavior that’s just not acceptable and you go into protection mode. You are now thinking don’t mess with that which in precious to me and then you snap back and say okay Lord I am in position and ready for You to use me. Whatever it takes to avoid this from happening again. I say this to say sometimes you may not understand why you were put in a certain position but then Boom it happens and you wonder how did this get to that point but you are ready to do whatever to protect or avoid it from happening again. What I’ve learned from this is that sometimes we have to just let go and let God. You may not see in the beginning but when that moment accur you will have more understanding. Lord govern my footsteps! As iron sharpens iron, so one person sharpens another. God’s loving hand is definitely upon you. Have a lovely day. Thank you Dr. Dee Dee. Just yesterday, I addressed something on my job and the outcome wasn’t pleasant. Afterwards, I thought about it and God spoke and asked me “Did you ask me if this was a battle for you to fight?” The answer was no I didn’t. God was speaking the whole time but I didn’t stop to think or listen so now I’m in the place of fixing it. I asked Him, Lord teach me how to fight the good fight of faith, with love and without acting out in my hurt. I’m all in, Dr. DeeDee!